Today Paul, Grant and Aaron will race in the Kentucky Derby Festival Marathon. While the race course looks to be mostly flat and fast going through Downtown Louisville, there are two hills to contend with. One is at mile 12 and the second at mile 23. As you can imagine, hills and wheelchairs don’t go together very well. But that’s not the only obstacle that the 50 Ability Marathons Team will be going up against. Once again they will be racing in the rain and cold. It is forecasted to be in the low 50’s at the 7:25 a.m. Race time and is projected to have showers from 6:00 a.m. Through the remainder of the day. 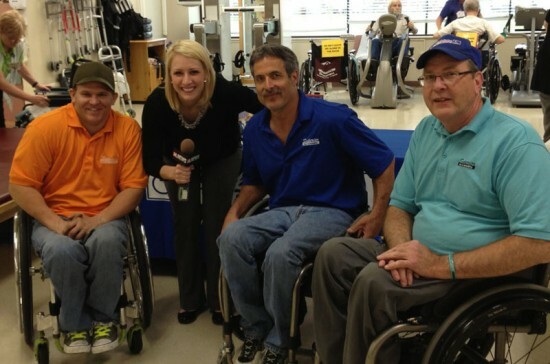 At Healthsouth Deaconess Rehabilitation Hospital being interviewed by Allyson Kraemer of 14 News from Evansville, IN. Click the picture above to watch the 14 News Story. 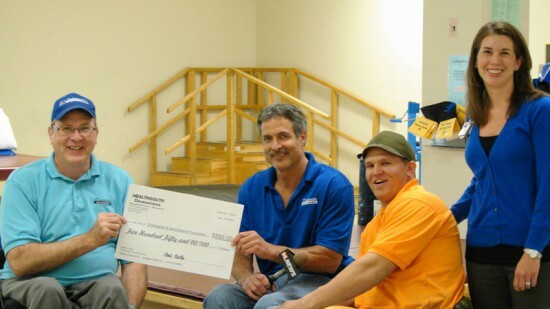 After the presentation at Healthsouth Deaconess Rehabilitation Hospital in Evansville, IN, they presented a check to Paul, Grant and Aaron for the Christopher & Dana Reeve Foundation. 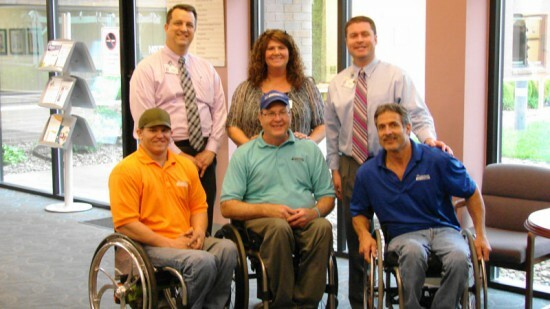 Aaron, Paul and Grant pictured with Marketing Staff at Healthsouth. 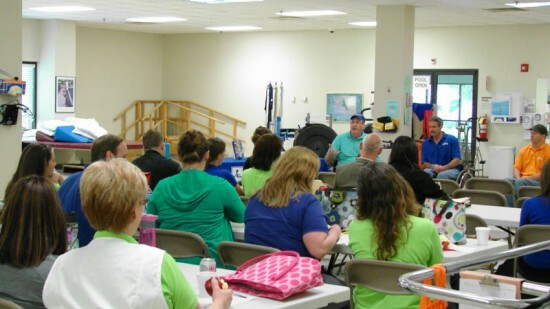 Staff and Patients attend the presentation at Healthsouth. 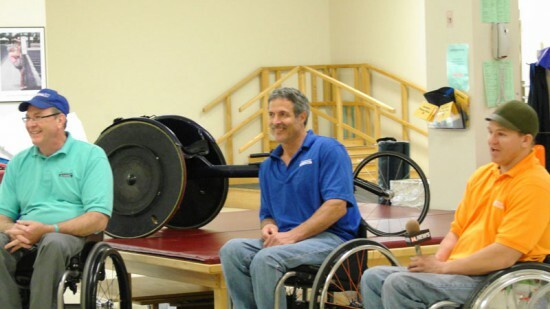 The goal is to inform people about mobility equipment such as racing wheelchairs and to encourage mobility and exercise for patients once they get back home. Aaron Roux answering questions after the presentation. Grant with Lindsay Allen of WDRB News. Click the picture above to watch the story. 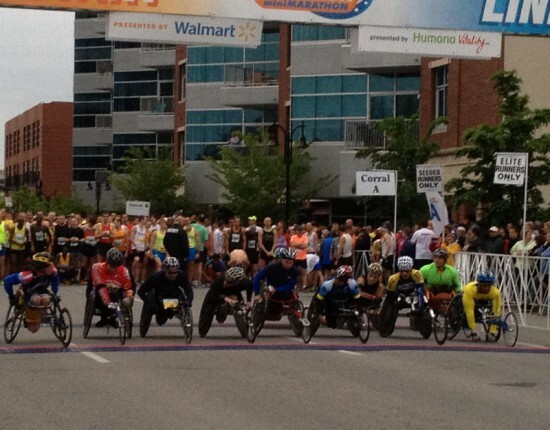 Wheelchair Racers on the Starting Line.